Five days a week, except when it rains or snows, Elaine Kilbourn leaves her office at Darien Town Hall on lunch break for a brisk walk along the busy streets around the building. Nearly every day, she covers roughly 2½ miles. Kilbourn, a Stamford native and grandmother of eight, began her midday routine about three years ago as a way to shed pounds to look better at her grandson's wedding in Texas. 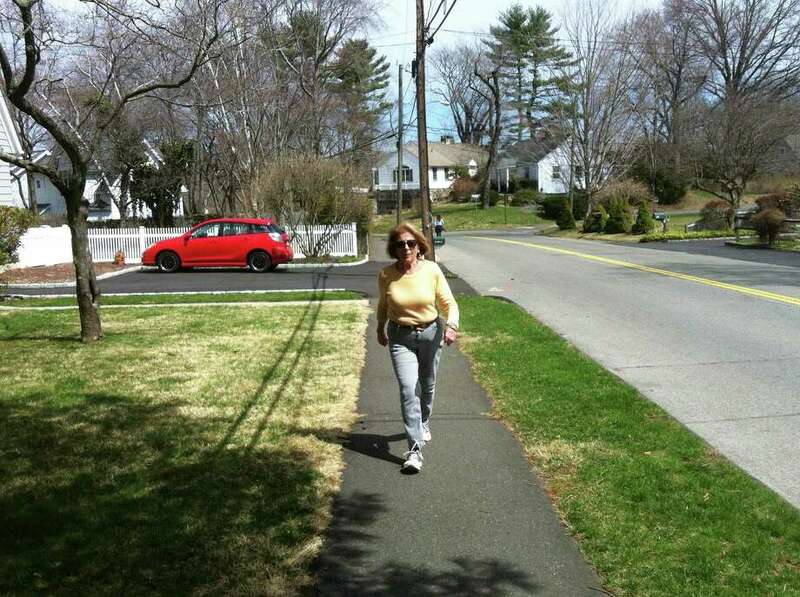 "I wanted to lose weight and get fit," the New Canaan resident said. "But then it became enjoyable. Walking feels really good." Recently, Kilbourn's daily regimen caught the attention of Darien's Health Director, David Knauf, who saw Kilbourn walking one afternoon on Ledge Road when he was driving to the Whole Foods Market near Town Hall. An idea was sparked, and this spring the Darien Department of Health is challenging residents to match the commitment of Kilbourn, a self-described "senior-senior," with a public campaign called "Keeping Up With Elaine." Participants are being asked to walk each day, just like Kilbourn, and post their daily mileage to the department's Twitter account at www.twitter.com/darienhealth, where they can also see the details of Kilbourn's daily workout. With people maintaining busy schedules, Knauf said Kilbourn's work ethic and regimen is a good example to people of all ages of the importance of fitness. "We should all strive to have healthy lifestyles like she is doing," he said. "I don't think that many of us walk as much as she does on a daily basis." Knauf said the point of the challenge is to try to use social media to prompt residents to examine their own fitness habits, and at least match or surpass Kilbourn's commitment. "I'm going to keep it going as long as I can, posting her mileage and engaging people," Knauf said. "Being fit is not one of those feel-good things where you show up one day and it is done. It is a lifestyle thing." Kilbourn has worked for the town of Darien since 1986, and now works full time as the office administrator for the town's health and human services departments. She and her husband raised five children, moving from New York City to Rowayton after the birth of their third child. While the job is demanding, Kilbourn said it keeps her mentally active scheduling appointments and organizing important aspects of services, such as the renter's rebate program through the department of human services. "I've always worked and I'd certainly like to keep working for a couple of more years," Kilbourn said. "I don't think I could just sit at home." Each day, Kilbourn walks out of Town Hall and down Park Place to Noroton Avenue onto Ledge Road onto the Post Road and back up Renshaw Avenue to work, a loop that takes about 40 minutes to cover. "I think walking has been very good for me and over time I've extended it to become a little bit longer," Kilbourn said. "It's something I enjoy."